There has been increasing need for energy-efficient solutions in data centers worldwide. The market for green data centers is observing high growth with environmental regulations and rising energy costs. Moreover, the evolution of cloud-based solutions has made it vital for companies to monitor and control their data center usage. The high demand for data storage has created constraints in storage capacity, creating a need for energy-efficient solutions to store data. 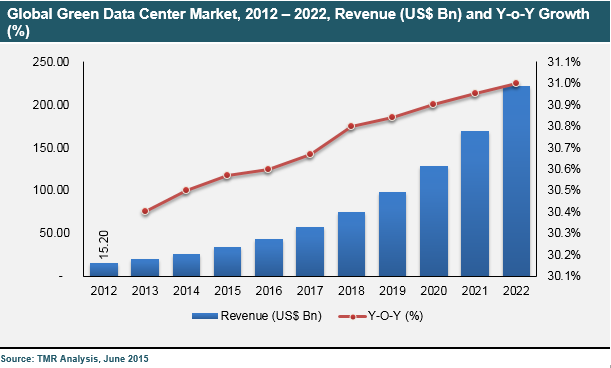 The global green data center market accounted for US$ 25.87 Bn in 2014, and is expected to expand at a CAGR of 30.8% during the period from 2015 to 2022. The implementation of advanced technologies such as economizers for cooling in data centers has resulted in improvements in efficiency and minimized environmental impact. Green data center solutions have benefited the businesses via efficient solutions for the management of IT data centers. Recently, green data center solutions have observed demand beyond the IT sector, with the banking, financial services, and insurance (BFSI); telecommunications; and healthcare sectors also considering their implementation. Reduced e-waste and low carbon emissions with the use of alternative energy technologies are some of the additional advantages of green data centers. The global green data center market is segmented on the basis of PUE standards into PUE 1 to 1.5, PUE 1.5 to 2.0, and PUE greater than 2. The PUE greater than 2 standard segment dominated the market in 2014 and is expected to hold the major market share by 2022; however, the PUE 1 to 1.5 standard segment is predicted to grow the fastest over the forecast period from 2015 to 2022. Components of green data centers include air conditioning, power units, storage and servers, network devices, and security appliances. In terms of the end-use industry, IT, telecom, and healthcare are anticipated to swiftly adopt green data center solutions. On the basis of ownership types, the market is segmented into external and internal ownership. Within external ownership, co-location is predicted to hold the major demand by 2022, rather than dedicated hosting. Internal ownership is further sub-segmented into healthcare; IT; telecom; government; banking, financial services, and insurance (BFSI); energy and utility; transportation and logistics; and others. IT and telecom are the two major sub-segments in internal ownership that are predicted to account for a major market share and grow fastest in the coming years. Geographically, North America and Europe accounted for the majority market shares globally in terms of revenue generated in 2014. This trend is expected to continue in the coming years; however, Asia Pacific is expected to grow the fastest during the forecast period from 2015 to 2022. This can be attributed to rise of IT sector industries in Asia. Furthermore, the growth of the healthcare sector would be one of the major factors driving the green data center market in Asia Pacific in the coming years. Other regions, such as Middle East and Africa and Latin America are also expected to witness significant growth in the coming years. The green data center market is witnessing intense competition, with companies focusing on energy efficiency within their data centers and offering green data center solutions. Some of the key providers of green data center solutions include Cisco Systems, Inc., Ericsson, Fujitsu Ltd, International Business Machines (IBM) Corporation, and Hewlett-Packard Company. Other significant players in the market include Dell Inc., Equinix, Inc., Tech Mahindra Ltd., Eaton Corporation Plc., Ecomnets, EMC Corporation, Emerson Network Power, Hitachi, Ltd, and Schneider Electric (APC).